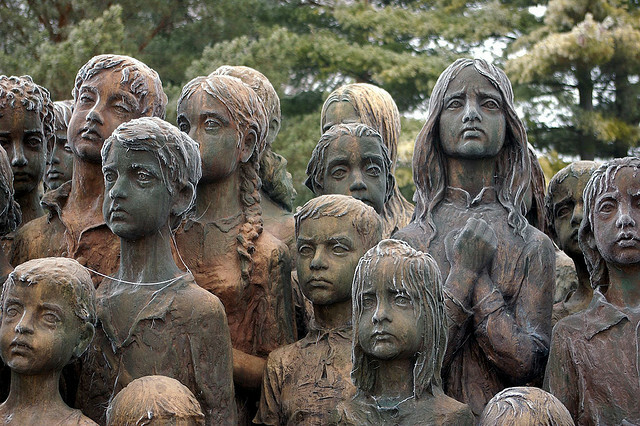 On 2 July 1942, most of the children of Lidice, a small village in what was then Czechoslovakia, were handed over to the Łódź Gestapo office. 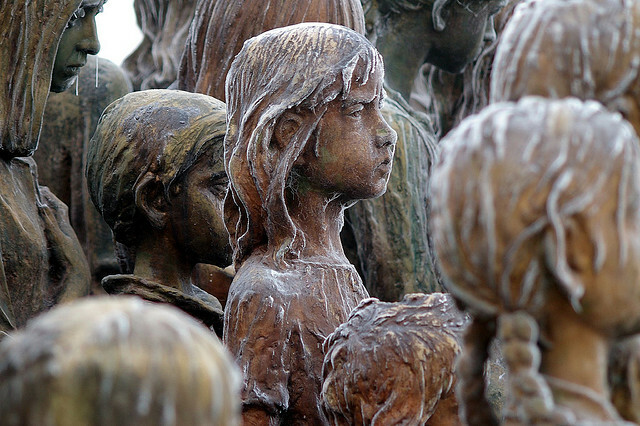 Those 82 children were then transported to the extermination camp at Chełmno 70 kilometers away. There they were gassed to death. 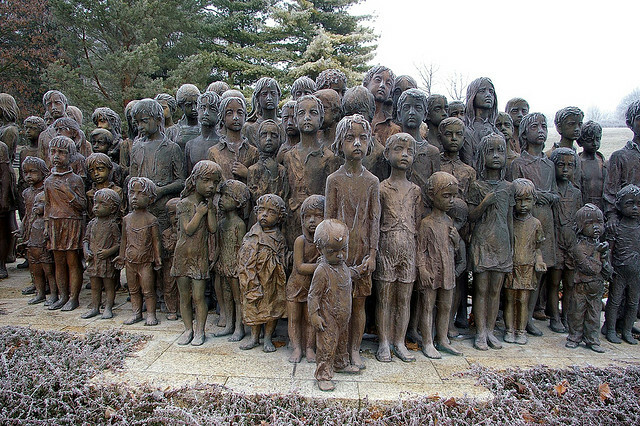 This remarkable sculpture by by Marie Uchytilová commemorates them. Yet what had they (and their families) done to warrant such an end? The events leading to their death were complex but the pivotal moment had been the assassination of the Acting Reichsprotektor of the Nazi Protectorate of Bohemia and Moravia, Reinhard Heydrich. Czechoslovakia had been occupied by Nazi Germany since the April of 1939 and Heydrich was a greatly detested figure of oppressive authority. He was attacked by a British trained team of Czech and Slovak soldiers. From the moment of his death a week later on June 4, 1942, from septicemia caused by his injuries, the whole country knew there would be reprisals. Nothing, however, could prepare them for the horror that was to come. A state of emergency had already been proclaimed, as well as a curfew in the capital of Prague. A huge search of the city for the perpetrators followed to no avail. The assassins had disappeared. By the time of Heydrich’s death, however, 157 people had already been summarily executed. Worse was imminent. After Heydrich’s funeral in Berlin, none other than the Fuhrer, Adolf Hitler, commanded that four things happen to the inhabitants of any village found to have harbored the assassins. 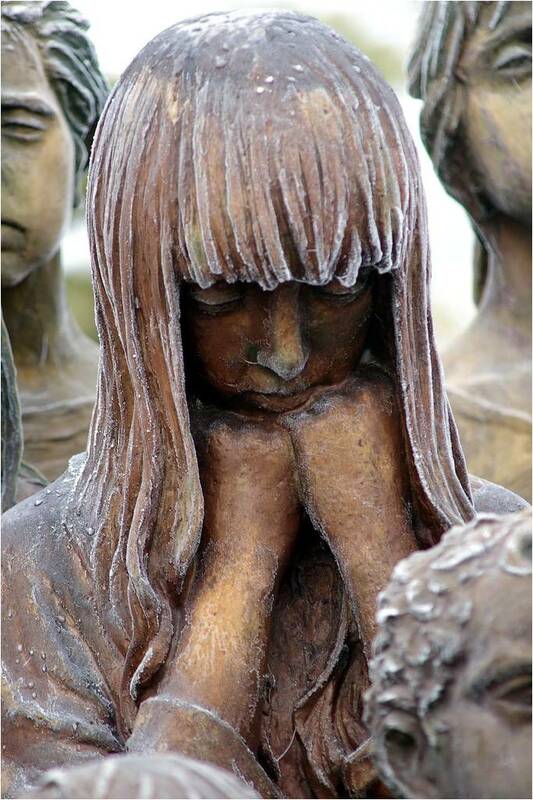 All adult men were to be executed and the womenfolk transported to a concentration camp. 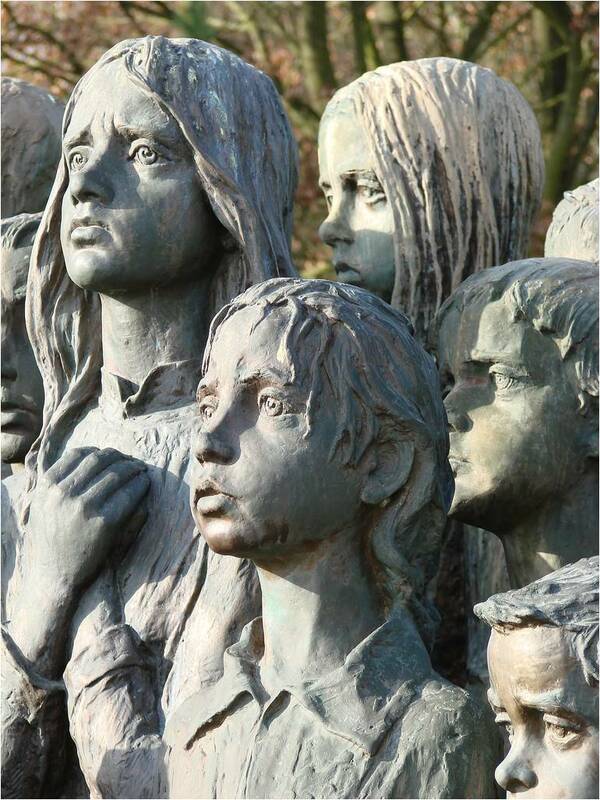 The children were to be gathered and those who were suitable for Germanisation (who showed distinct Aryan traits) were to be placed with SS families and brought up as good Nazis. The rest were to be brought up in 'other ways'. Finally, the village was to be leveled, any trace of it to be annihilated. His orders were carried out immediately. 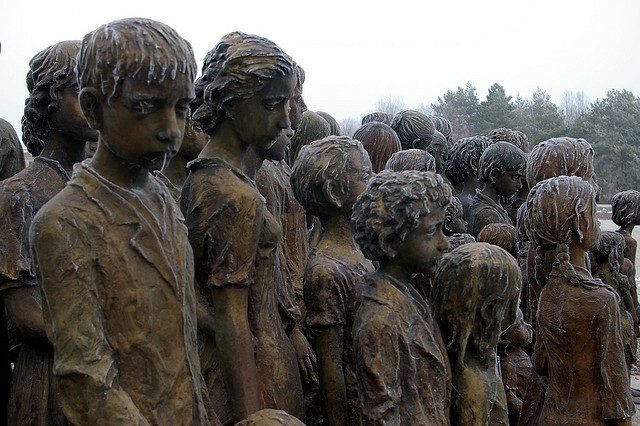 The village of Lidice was surrounded, despite the lack of any evidence that they had sheltered the soldiers responsible for the assassination. The men were taken to a farm on the edge of the village and shot, first in groups of five and then ten when the instigator of this horror, Horst Böhme, complained it was taking too long. By the afternoon, 173 men lay where they had been shot. 203 women and 105 children were at first taken to the village school. 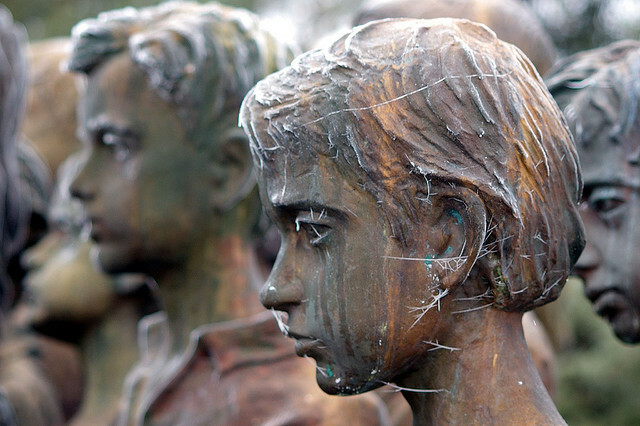 They were taken from there to another school in the nearby town of Kladno. Four of the women were pregnant. They were taken to the same hospital where Heydrich had died and their babies were forcibly aborted. 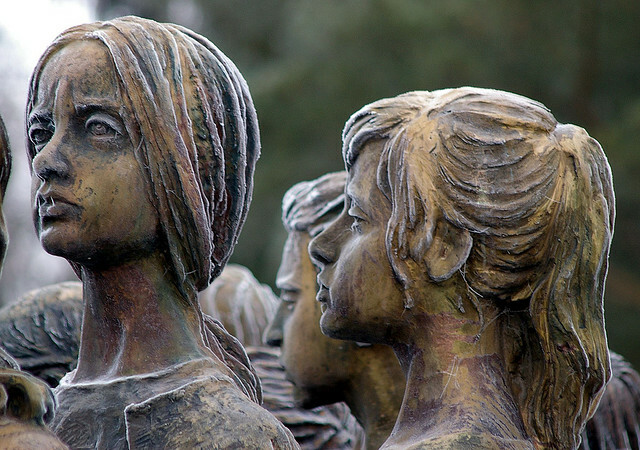 Most of the women were taken to the Ravensbruck concentration camp where a number perished through disease. Yet what of the children? 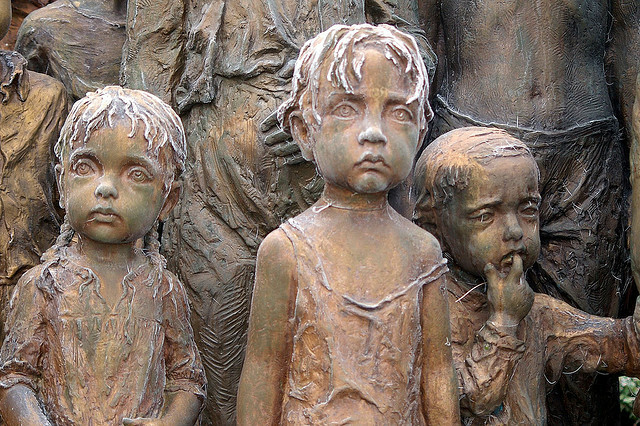 They were first taken to a disused factory in Łódź and effectively dumped there: no medical care was offered despite their obvious lack of hygiene and suffering in the week since they had been abducted from their homes. 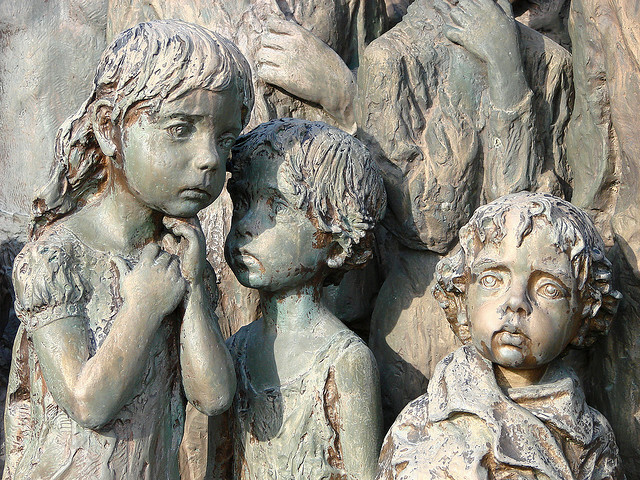 Officials then turned up and removed a number of the children for Germanisation. 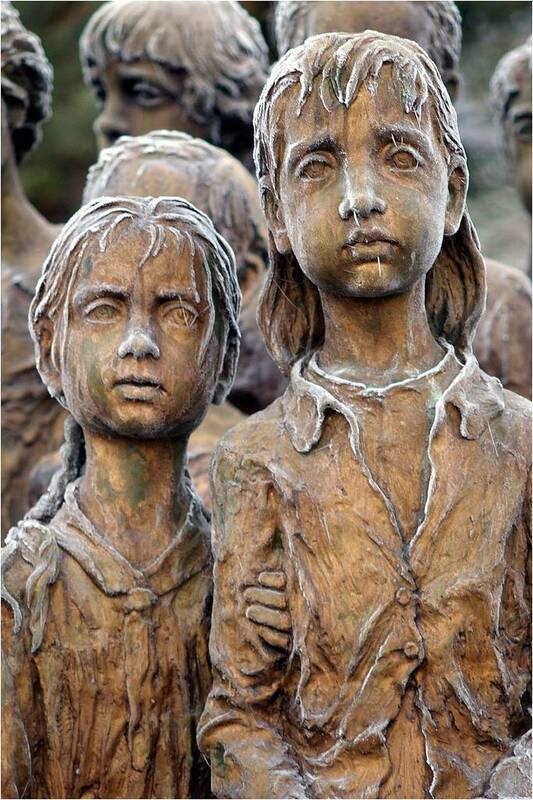 These children, from eye witness accounts chosen randomly, were then given to SS families to raise. There has been some hesitation when concluding for history the final fate of the other children. Yet at the end of June, Adolf Eichmann, already facilitating and managing the logistics of mass deportation of Jews to ghettos and extermination camps in German-occupied Eastern Europe, ordered their massacre. 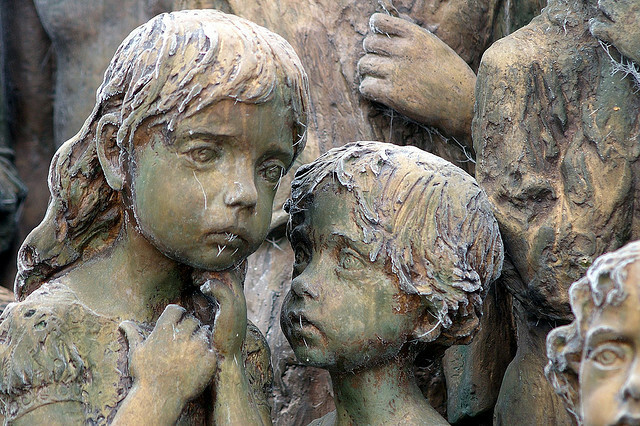 Seventy years ago to this day (2 July) the remaining 82 children were handed over to the Gestapo. 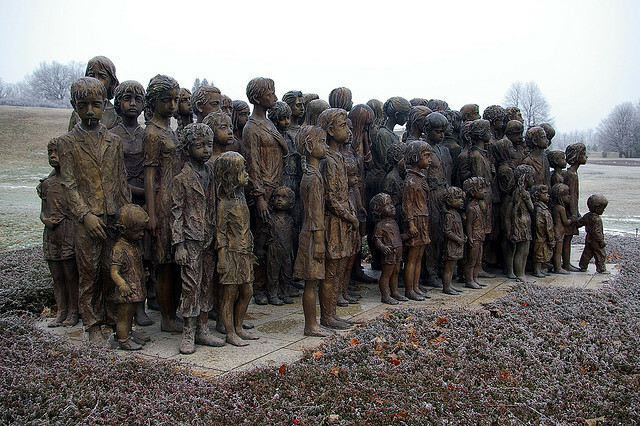 From there they were taken to the Chelmno extermination camp where they were gassed. 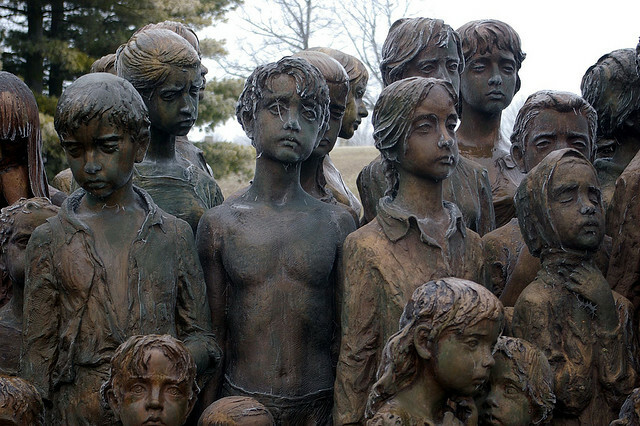 Out of the 105 children of Lidice, only 17 children ever returned to their village. 153 women made the return, formerly wives and mothers, now mostly widows without children. 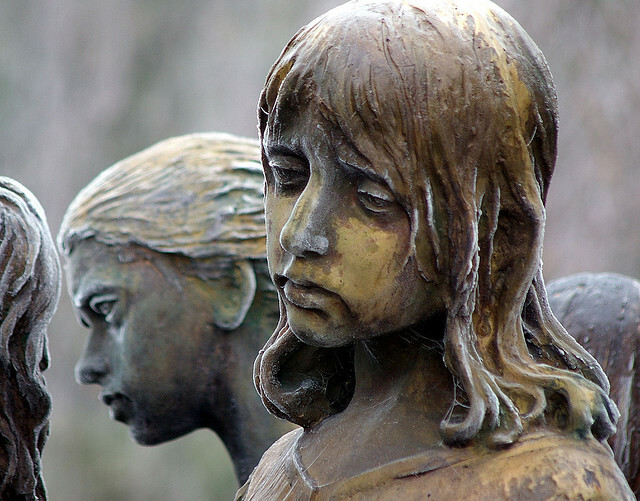 No one will ever know if anyone wept as these children perished, far away from home and their mothers and fathers. 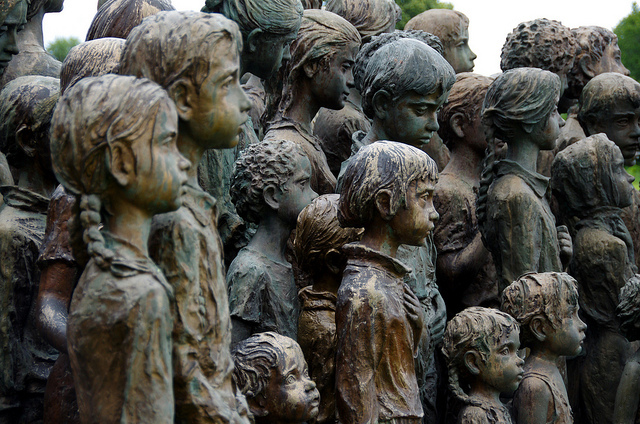 Yet, after a manner, the children, those slaughtered innocents, returned and will forever inhabit Lidice. 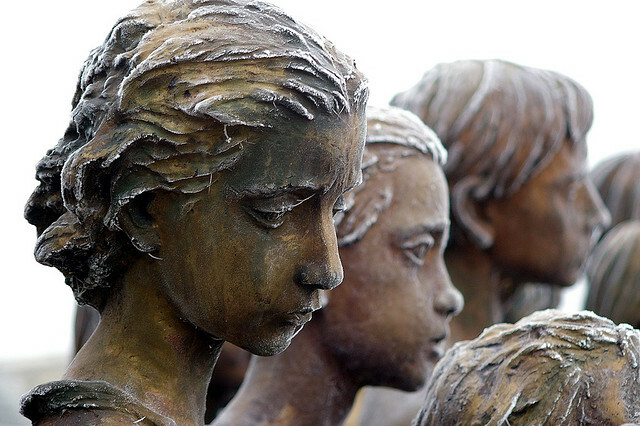 The 82 bronze statues, 40 boys and 42 girls, stand as an everlasting reminder of the massacre. 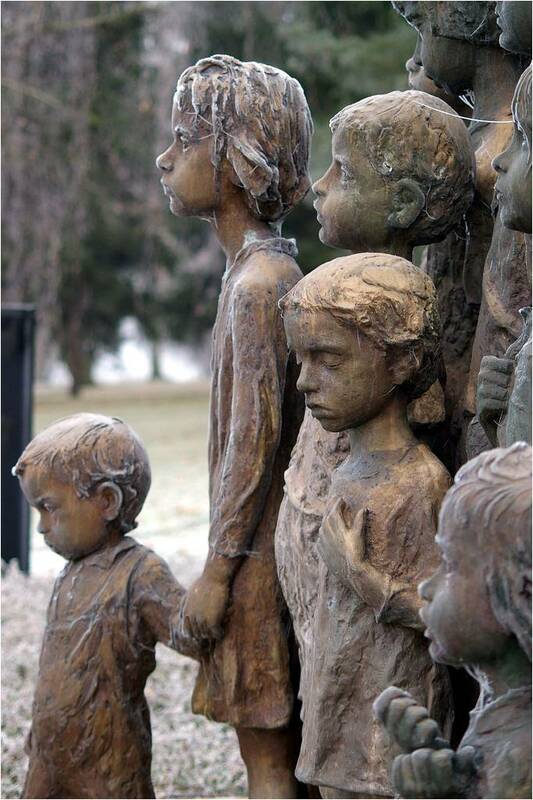 The children of Lidice are home where they belong. Thanks to Flickr Photographers Donald Judge and Adam Jones.